Food is crucial to our survival– we know this, and lucky for us it’s a delicious enjoyment we get to indulge in, multiple times each day. However, we don’t often approach food with the gratitude it deserves. The fact that in order to sustain our bodies and minds, we only need to chew and swallow, is amazing. Think about why you actually eat– it’s a regular, everyday practice, but because of its frequency it often gets overlooked. Do you eat because you’re hungry? Low on energy? Perhaps you’re bored? Whatever the reason, you hear people say “I eat for my health” or “I eat to maintain my figure” far more often than “I eat to nourish my body”– when really that’s exactly what you’re doing (or should be doing) by eating. Food serves as sustenance, that is, macronutrients and micronutrients that give us fuel– the energy to carry out our daily lives. Words like ‘nourish’ and ‘sustain’ are thrown around in relation to food, but they are often misused. They concern not only what type of food you choose to put into your body in order to achieve nourishment and sustenance, but also your mindset. This same forgetfulness extends to the way we eat– we have an intuition for a reason, yet sometimes we eat mindlessly because food is so accessible. We might also force ourselves into following strict meal times that are structured around our working day or busy schedules, never mind the fact that we might just not feel hungry, and should listen to that. The type of food we choose to eat is often shaped by the convenience factor too. There’s no denying we all lead busy lives, but many of us are guilty of constantly balancing our busyness, tiredness and stress on foods and beverages that lift our mood when we need a boost, like coffee, alcohol, energy drinks and sugary treats. 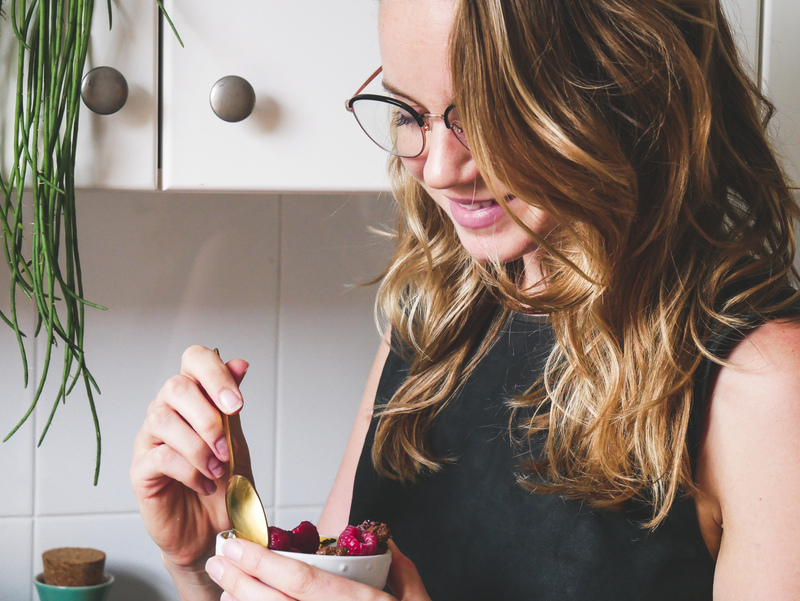 Bringing awareness to the types of foods you’re eating, the origin of your food and your feelings, thoughts and actions while you’re eating is a neat little package commonly referred to as ‘mindful eating’– a wonderful practice you should try. Have you ever truly experienced your food? Its smell, the way it feels in your hand, its texture, its mouthfeel, the top notes and base notes of its flavour? Try it! Turn off the television, put down your phone, step away from your desk and savor each and every mouthful. You’ll notice that you’ll feel more satisfied, more connected to what you’re eating, you’ll enjoy your meal more and will digest it better. Take some nice, deep breaths before you eat, then close your eyes and enjoy the experience. Tryptophan– This is the name of the amino acid which acts as a precursor to serotonin which is also known as the hormone of happiness1! Tryptophan is rich in foods like eggs, salmon, spirulina, sesame seeds, cashew nuts, bananas and chickpeas2. Tryptophan is really useful for lifting the mood, fighting anxiety and even reducing sugar cravings. Magnesium– Magnesium is the fasted-depleted mineral within the body, especially during times of stress. Magnesium is known for its ability to relax the central nervous system. Food sources of magnesium include; pumpkin seeds, almonds, spinach, bananas, brown rice, yoghurt and avocadoes. Calcium– When the body is stressed, it’s triggered to encourage the excretion of calcium, which caused the displacement of calcium and other minerals within the body. The symptoms of Calcium deficiency often masquerade as anxiety, which also cause other anxiety-related symptoms including; heart palpitations, shaking and numbness4. Sources of calcium include; dairy, tofu, sesame and broccoli. B Vitamins– The main role of B Vitamins is to facilitate energy production. They help the body break down and utilize energy from the food we eat and store it for prolonged stamina. Folate (Vitamin B9) and Cobalamin (Vitamin B12) are also essential for the optimal development and functioning of the central nervous system, hence their role in happiness and stress-reduction.